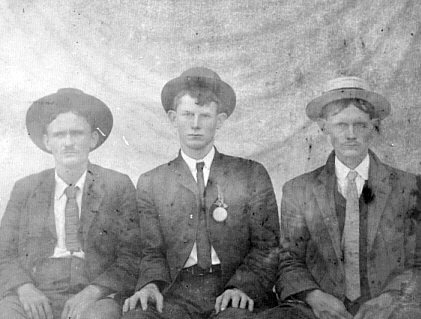 These three men are believed to be Franks men from Marion County, Alabama. If you can identify them, please contact me. And if you have pictures of other Franks men or women who belong to the Caney Forks Franks clan, I would like to post them on my web page. living in these two counties today. marriage and cemetery data) and speculation. posted on my web page but may not be up to date. sparse. Use your browser to search for an individual. 1839 Itawamba Co, MS Tax List: Anthony Franks. No other record of Anthony Franks. **13 Apr 1841, Itawamba: Benjamin Franks m Levicy Rowdon. **1841 Itawamba State Census: Bj. Franks, 1 in fam, p2. **1846 Itawamba Tax List: Benjr Franks. **Note: From name of wife, this is probably not the same Benjamin Franks. **He was not on1860 Caldwell, TX census; nor was John. **1800 age 6-25 ?, 1810 age 16-35 ? the 1820 census, 00011-00101. See Charles #2 below. younger, at age 20-30. See Charles #3 below. C. 15 AL, John 14 AL, Caroline 11 AL. man is younger than the Charles in the 1820 White, TN census. According to Bob Franks, Charles is a son of John Franks #1. J 10 MS, Elijah G 8 MS, Matilda K. 7 MS Josiah 3 MS, Pomp ? mlbfred@bellsouth.net  .... Her gr gr grandchildren live in Marietta, MS.
and she gave me a picture of Josephine, dau. of Matilda & Lemuel. Witnesses: Elijah Franks and Elisha Franks. Franks appointed road overseer from Franks ferry to top of bluff. Joseph Franks to supply list of hands. **1840 Census:  Cannot find Elijah, age 42-43.
for AL between 1825 and 1829. [William D. 12 and John 14 may be the sons of Lemuel B. 1830 Census ? Elijah S. was 7. 1840 Census ? Elijah S. was 17. AL, Mary I 2 AL, William H. 6/12 AL, p 168-566-581.
is in the 1840 Census. Elisha (age 50 NC) is in the 1850 Census. I do not have a record after 1850.
or Pinava b. ca 1805 in NC  Children: 1. Elisha D. m. Fairby? 2. Elijah S. b. Dec 17, 1822 m. Sarah Francis White 3. Priscilla m.
William Warren 4. James B. b. ca 1827 m. Eliza J. b. ca 1825 5. Atkins b. ca 1832, d. Jul 15, 1912  8. Alvin J. b. ca 1836 9. 1. Elisha D. FRANKS b 1820 in TN m Pheriba ? 4. James B. FRANKS b 1827 in AL m Eliza J. ? Williams, R.O.F.E. Publications, PO Box 3793, Santa Cruz, CA 95063-3793). Ferry Road" still appears in one of them. poles. ELISHA DENTON FRANKS and ELIJAH FRANKS were his witnesses. *** New Information DNA DATA proves that Jeremiah Franks (1791) and Elisha Franks (1800) are brothers. He was the son of ELIJAH FRANKS #1. T 9 AL, Roxey Ann 5 AL, Malvina 2 AL, p109-5-5. Note: Allen Franks m. Sarah Ann Thomas 26 Feb 1858. Note: Center Methodist Cemetery, Marion Co, AL: Elisha D.
Rowan 398 and William Sr. 26-45.
records of Cabarrus or Rowan County, North Carolina in 1804. So he probably started his westward movement about that time. and Cabarrus Counties, North Carolina." vs Harvey Franks, suit dropped. 1810 Census:  White or Warren County, Tennessee? for State vs S.K. Charles. Henry is over 45. His wife is 26-45. HENRY FRANKS, exempt from poll tax, page 226.
appearance in court for State vs S.K. Charles, page 262.
acknowledgd 21 Oct 1818, page 257.
church admonished his wife Nancy to do something about it. than the wife shown in the 1820 census would have been. Henry Franks in White County, TN in 1818.
brother to Ezekiel Elledge and had likely come from White County as well. Proved by the oath of HENRY FRANKS in Greenville Dist. HENRY FRANKS lived in the Horseshoe Bend and was a poll tax payer in 1812. He asked the county to excuse him from paying taxes in the year of 1813. Caney Fork District, Warren County, Tennessee in the early 1820's. Isaac is probably the son of Joseph Franks. 1840 Census: Age 33. Neither Joseph or Isaac are found. 10 Sep 1853, Itawamba Deed Book, Isaac Franks to Samuel A.
p10; Isaac Franks Sr. 3 male 2 female, p10. 25 Dec 1856, Itawamba Deed Book, Isaac Franks to Samuel A.
Rebecca Jones Franks, widow of Joseph Franks. Based on 1830-1840 census data, Jacob was born ca 1740-1750.
are 7 children in the household under 16. Franks, witnesses Wilson Upchurch and Daniel Walling. 20-30 woman in the household. his wife would be 30-40. TN tax lists by 1812 and was still in White Co. in 1818.
his $225. Vouching for the sale were WILSON UPCHURCH and DANIEL WALLING. and his family composition is different. He is listed as Jacob jr.
the reported ages are different as is the family composition. Tennessee records are included under Jacob #3 and Jacob #1.
is in the Marion census age 70 (1780). be a daughter in law. 1820 Age 5 ? 1830 Age 15 ? 1840 Age 25 ? AL, William 11 AL, Lucinda 9 AL, Charles 7 AL (may have m.
state in 1850-1860 census is TN and in 1870 census is AL. had two sons in the 5-10 year bracket. County, AR and he had one son in the 10-15 year bracket. 10? acres, $76, signed James Franks (seal), witnesses John W.
Gann and Lemuel x Franks. Upchurch and Henry Warren, LDS Film 0507908. - JAMES FRANKS, juror, 22 Jan 1819, page 321. - JAMES FRANKS, juror,20 Apr 18191 page 344. 1820 White, TN Census: James FRANK (26-45) 12001-2021.
two men in his household age 20-30.
price was $150. JAMES FRANKS was often a witness for other family members. He was born 1786 in Georgia he stated in DeSota County, Louisiana in 1850.
both born in Tennessee. JACOB T. FRANKS born in 1814 and JOHN A. born 1823. Another son, JAMES M. FRANKS born 1826 in Alabama. and  had one son of 15-20. 30 recorded in the census. 1850 Marion Co, census:  James B. 23 AL, Eliza 25 MO, p168-569-584. family history there is mentioned that Eliza Jane married a FRANKS. know if he survived. Nothing after 1860. Jeremiah was b ca 1791- 1792 in Georgia. Jeremiah's first child was born in Tennessee 22 Oct 1815.
named Oliver, David and Lemuel. Counties about 1820, he was not on the census of either county. daughter (age 4 or 5) and possibly two other daughters age (0-5). McWhorter, acknowledged 2 Jul 1811, registered 19 Nov 1822.
ack 7 Apr 1828, reg 6 Jun 1828.
ack 7 Apr 1828, reg 9 Jun 1828. Franks, was my third great grandfather. DAVID BAIN b 1787 Fluvanna Co, VA to MARY "POLLY" FRANKS. David Bain died before 1863 in AL. and living in Itawamba County. 1860 Fulton, AR Census. Jeremiah is living with his son. Larry Rader llrader3@gte.net are tracing Jeremiah. this because the acreage, years & and grant nos. are identical. in Warren Co., at least, close to Augustus Gunter and Claiborne Gunter. from Augustus (1) Gunter down into the life of his grandson, William T.
1840 age 39 ?, 1850 age 49 ? references of Jesse Franks in this ledger. Sent by cassie@iicountry.net: Jesse Franks b. 1801 in SC, and d.
From Verna Ashley:  "Jesse Franks married Mary "Polly"
Moore, daughter of Samuel Moore born ca. 1780." b. 1829; d.?, 4. Mary (Polly) Franks, b. 1833, 5. Peter B. County., TN. They had a son Spencer Franks., b. 1847. Francis Marcon Franks b. July 26, 1852; d. Dec 7, 1932. 2. Almedia Franks b. 1870.
and west by M. L. MOORE'S land and on the east by widow TEMPLETON'S land. on 85 acres of land. MARY FRANKS does not appear in the 1870 census. Descends from the Franks of Caney Fork, TN. received 6 grants totaling 735 1/2 acres in the same area as the others. in the 1810 Rowan County, NC census. that he moved from TN to AL between 1828 and 1832. WHERE SAID FRANKS NOW LIVES. Shirlock. John was born 1755-1775. County, North Carolina census records for 1790. Hillsborough District. 1840 was a widow born in 1790-1800, and lived in the second district. 1. ELIZA JANE STACEY born 1843. EMMA SWAFFORD on 31 December 1895 in White County. 3. SARAH ANN STACEY born 1849. 3. THOMAS S. FRANKS married 26 May 1854 CATHARINE JACKSON. Andrew Jackson had no children of his own. 031-00112001. The eldest woman in this household is 50-60. Bluff, Arkansas with youngest son named Ambrose." part of this family...but I'm still working on proof of his heritage. period about 1820 was this same family. and about this very same time George Rogers moved on to Tippah Co., MS.
Martha A. 24 MS, John B. 5 TX, Lemuel A 3 TX, Daniel 1 TX. 1790  Age 20-30 ...  1800 ? Age 30-40 ? ... 1810 Age 40-50 ? Willie Blount (p262), Joseph Franks to Charles Sulivan (p263). Taylor, witnessed by Joseph Franks. Franks of White County to Lewis Franks, 5 acres, $260. Men age 18-26 = b. 1794-1802, 3 men age 19-16 = b. Fox, Turrell x Hallfore and John W. Smith. Turrell x Hallfore and John W. Smith. 1840 Census: Joseph is not found. been appointed a peace officer a few years prior to his death. Furthermore, Joseph operated a ferry across the Caney Fork." FRANKS, pages 78, 146, 245. 50 acres, p2. ** JOSEPH FRANKS ferry, page 3. ** George W.
White County Court Minutes (1835-1841): - JOSEPH F.
FRANKS, assigned to road work, pages 103., - JOSEPH F.
would also be a tobacco weighing station. He donated two parcels of land. near the end of the Civil War.........."
1810 from the land granted to EPHRAIM DANIEL for military service. 1812. ELIJAH died in 1816 leaving a son, JOSEPH, and a widow, named POLLY. JOSEPH, her son, appears in the 1820 census records. White Co, TN County Court Minutes (1835-1841),  Joseph F.
Franks assigned to road work. 1800 0-10 ?, 1810 10-20 ?, 1820 20-30 ? 1840 age 40-50 ?, 1850age 50-60 ? 1850 Census ? Age 15. (seal), witnesses: William Lawrence and Ezekiel Elledge. White census have this family composition. William Upchurch, ack ?3 Jan 1826, reg 28 Aug 1826. (45) and his wife is 30-40 (1211001-200201). 1850 Census of Izard County, AR. Lemuel is 65 and from GA.
household. Lemuel's age is consistent for the 3 censuses. 1860 Census of Parker County, Texas. M Fanks 72 W F domestic VA [I assume that M is a misread of N for Nancy. entered land on Walnut Creek in 1850's. a widower in Lincoln Co., TN. If I find more specifics, I'll let you know. 1829 and arrived in AR between 1848 and 1849.
and actually became part of Izard in the 1860's. 1811-1822 but not later years. LEMUEL, JOHN and JEREMIAH FRANKS stated they were born in Georgia in 1850. POPE, BARNEY POPE and THOMAS WOOTEN. in Wilkes County, Georgia between 1792 and 1794.
as JAMES FRANKS lived nearby and he said he was born 1810 in Tennessee. JAMES lived in Alabama in 1842 and was in Arkansas by 1845.
in the area. Both JAMES II and JACOB had sons named THOMAS. 1850 Census and his 1850 wife would have been 30. 20-30 (12012-3) and also page 51 Lemuel 10-15 (121-10011). Samuel 2 AL and Martha C. 8 mos AL. have found with two Lemuels on the list. that they knew each other in Tennessee but were not brothers. indicates several older children if this is the same Lemuel. Alabama; d. Apr 05, 1910, Itawamba County, Mississippi. **Peter , b. 1844, Marion County, Alabama. **Jeremiah, b. 28, 1920, Itawamba County, Mississippi. **Martha, b. Abt. County, Alabama; d. 1926, Itawamba County, Mississippi. household in the 1860 Census. Levin was killed by Jayhawkers during the Civil War. (Tyrissa Jane m. William Shue),  Mary 10 MS (Mary Ann m.
MS (Lydia Catherine m. Andrew Cook). 5 Dec 1852 Itawamba, MS, Archebald Taylor to Leven Franks. 1Nov 1858, Itawamba, MS, Elevin Franks to Whitfield Leak. 1820 Census:  He is not on the 1820 census. William and Elijah all about the same age. will designate this Lewis as Lewis #2. (See GROUP 3). GA or NC. Anyone tracing Lewis Franks? Good luck! Franks and Lewis Franks Jr.
November  1818. They were living in McNairy County, Tennessee in 1850. AL and Itawamba, MS is similar to the Franks' path. Jeremiah Franks 9 in family, Page 3 Oliver Franks 3 in family. 21 Nov 1842, Itawamba, MS, Oliver Franks grantor, Thos. H.
1910 Census: Oklahoma or Texas ? rguthrie4@juno.com ... are tracing Jeremiah. County, NC and he is over age 45 (30101-03001). Peter has not been found in a later census of TN, AL or MS.
on the lists of 1812-1823. He owned 30 acres in 1823. 1800 and White Co, TN in 1820 (reference Randy Franks). agree on the decade-with JOSEPH FRANKS was their security. 1800 Age 0-10?, 1810 Age 10-20, 1820 Age 20-30 ? indicted with several other FRANKS men for the battering of JOSIAH CAPSHAW. FRANKS born 1796 in Tennessee lived in Natitoches County, Louisiana by 1850. JOSEPHUS FRANKS born 1801 in Tennessee lived in Bossier County, Louisiana. JOSEPHUS had sons, CHARLES, ISAAC and JOFUS all born in Louisiana. only one son of this age. Itawamba County. His parents are not known to me. order based on their first name. 1 Dec 1842, Itawamba: Cilda Franks m James L. Watts. 16 Jul 1845, Itawamba:  Elizabeth Franks m Benjamin White. Isaac buried in  Hall Cemetery in Caldwell Co.
was s/o Abner Markham & Sarah Franks (ref: Phyllis Markham). 15 Mar 1849, Itawamba, Jane Franks m G.B. Gentry. 4 May 1842, Itawamba: Lidia Franks m James C. Williams. ** 1840 Census. They were in Itawamba Co.
Nancy Jane 15, Kizziah age ? (1794-1804) and she had her first child. family had moved to Desoto Co, MS.
households. Sarah Gann 39 AL, wid of Samuel was also in her own house. 3. William C. B: 1824-1826 Marion, AL, D:?, M: Eleanor Eliz. 4. A daughter born ca 1825. M:Eliza J. Ward 1859 Desoto, MS.
M: M.Lou Laughlin 1865 Desoto, MS.
11. Martha E. B:1841-1842 MS M:Lafayette Campbell '65. Wright McWilliams ca 1830 in what I believe to be Marion Co AL. [James W.
From: "Billy F. Dillon Sr."
Mansell b 1846 Lamar Co. AL. Rebecca in 1860 AL Census, Marion Co.
at Chancelorsville VA), Robert G. 14, Sara 8, Harvy 5 all b AL; Harvy m.
Monroe Co, MS. Lemuel Mansell, bro of Robert George Mansell d.  AR c 1890.
they were m. White Co, TN March 1817. **1820 White Co, TN  Census: Abner Markham 2001-001. **Abner Markham on 1822 White Co, TN  tax list. **Abner Markham on 1840 Marion Co, AL census: 21001-1. Where was Sarah?